The Celts, who were they? Where did they come from? Were they mystical druidic people of the British Isles – or gruesome, barbarian warriors who got under Caesar’s skin? The discovery of a mysterious tomb may soon shed more light on the lives of these enigmatic people. The story of the Celts begins in the heart of the European Alps. In a very special place called Hallstatt. Here, archaeologists have found remarkable evidence of a culture that thrived 3,000 years ago trapped and perfectly preserved inside sealed salt mines. In a massive nearby cemetery, the remains of over 1,500 people interred with countless precious artifacts have also been excavated. The salt of Hallstatt originated in a wide, shallow sea that existed 255 million years ago. For 7,000 years humans have mined it – the Celts managed to extract around 100 tonnes a year. From this remote corner of the Austrian Alps, the early Celts traded raw salt and cured products all over Europe, spreading their technical skills and cultural achievements. Rare, precious salt gave them wealth and power, and it gave scientists a unique window onto their world. When these mines were first opened, researchers were presented with a slice of time preserved for millennia. In deep shafts they found perfectly preserved organic material; mining tools, cooking vessels, rucksacks and even prehistoric toilet paper! 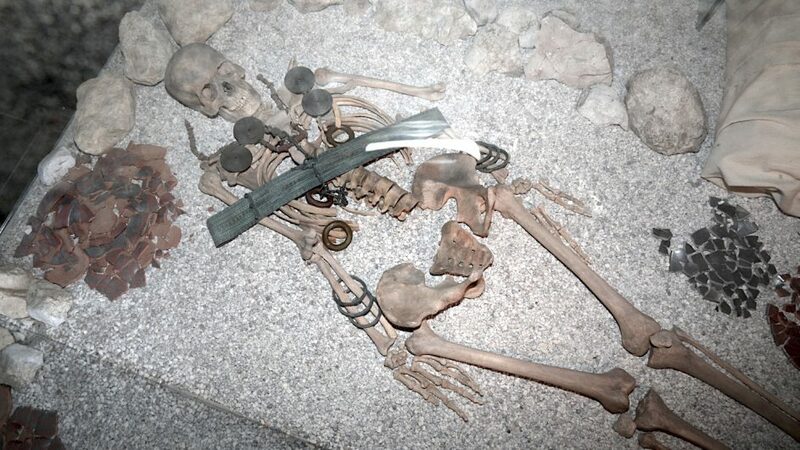 Golden amulets and earrings, luxury products from all over Europe as well as ivory from Africa and Asia were discovered buried with their owners in the Hallstatt cemetery; one of and largest prehistoric cemeteries in Europe. But now, archaeologists intend to delve much deeper into the lives of the first Celts with the help of other experts … like climate researchers, geologists and paleobotanists – and with cutting edge dating techniques. Together they will soon try to solve one of the strangest Celtic puzzles of all – inside a 2,400 year old tomb the remains of a woman and two men have been recovered. She was an aristocrat; they were giants of men. A shaman and her entourage? Relatives or sacrifices? What is the secret behind this ancient ménage à trois; could it be the first real evidence of mystical rites from the dawn of the Celts?